Last week was a fun and busy week with homeschooling and getting some projects done and just having fun with my family. That meant, I didn't have a lot of time to get super creative and just used what I had. I still think it has my personality but it does make me realize how much I love the artistic process of doing Project Life. I love how I can just add some doodling to really make it "me". 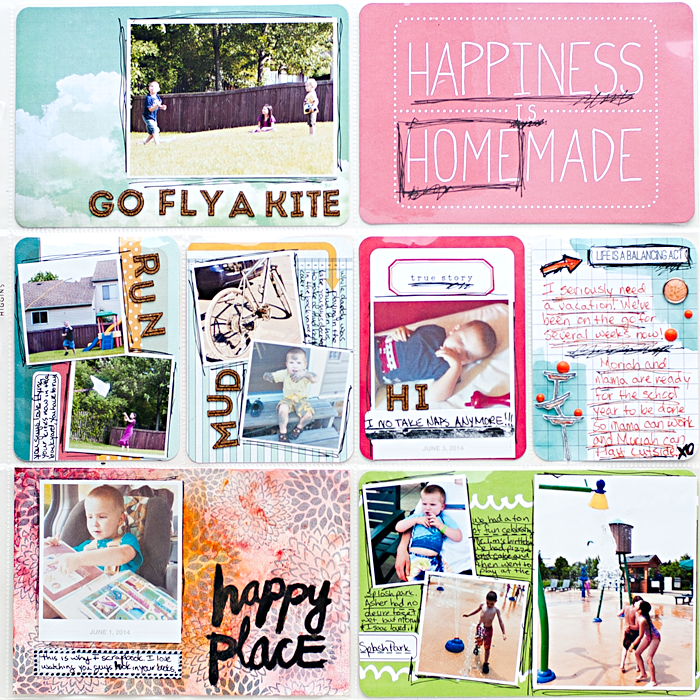 I also love that the mixed media tutorials help me to make some cards ahead of time to use. You'll recognize the card I made for last week by dipping in mist puddles. You'll also recognize one of the cards as a card I made for Sweet Stamp Shop new release. I ended up just adding them to the pockets, adhering the photos, using up a bunch of the alpha and then grabbing my handy journaling pen to journal and doodle on them. I really love how it turned out for being such a quick thrown together page. So, what do you do on the weeks you don't have a lot of time to really play? Do you put it off for another week, or do you just throw something together quickly and call it done?